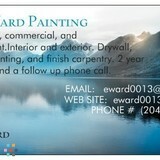 My name is Eric Ward and I have been a profession painter since 1999. I have experience with all levels of painting. I have worked with residential, commercial, and government, for both new construction and renovation. My experiences are demo, drywall, tape, mud, and paint. I have lots of experience setting up and using scaffolding, scissor lifts, genie lifts, and even have experience setting up and using a swing stage. I work on both interior and exterior jobs of all sizes. I also have allot of connections for other trades if needed. I hope you like what you see and we may have the opportunity to work together in the near future as I am sure that you will be pleased with the quality of my work.